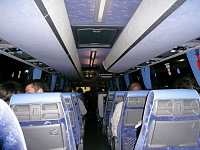 Traveling with National Express Coaches is a real joy, since the whole design of coaches has really moved on. Now you can enjoy almost futuristic travel, at retrospective prices. They carry over 16 million passengers yearly to over a thousand destinations in the UK and Europe, and to all major airports like Heathrow, Stanstead, Gatwick and Luton. All these users cannot be wrong and you are sure to be in good company when you book your National Express Coach trip to your next destination: for work or play. You can book your National Express coach journey here now! Facilities on board vary, but there are lots of design innovations to help your journey be just that little bit more comfortable, and fun. For example, with National Express all the coaches guarantee you a seat. Now that may seem pretty basic, but you cannot always be guaranteed a seat on the train and yes, you are guaranteed a seat on an airplane, but sometimes they overbook seats, so it is not a 100% guarantee! Clean and well maintained washrooms, which means that you don't have to worry about going to the toilet when on the move. Adequate luggage space and a very generous luggage allowance: You can take 40 kg, in two suitcases per person. But if you are traveling with more luggage, then where possible it will be accommodated. Now that is generous and unlike trains, there is plenty of space to accommodate luggage, so you don't have to climb over suitcases to get to the loo! Traveling between Cambridge and London offers you the opportunity to have a wifi connection, so you can even log on to the internet and do some work when you are on the move. Seats that have been ergonomically designed, so that they are comfortable and allow you very generous levels of leg room. A safe environment. All coaches are fitted with all the latest technological aids and equipment, to ensure that all travelers can be assured of the highest quality service offering maximum personal security. National Express provides the UK's only scheduled long distance network of luxury buses reaching about 1000 destinations across Wales, Scotland, Ireland, England and even out into Europe. Planning a trip could not be easier, since all the latest technology has been targeted at making travel easy, hassle free and an enjoyable experience. With lots of ways to book, it is very easy to plan a trip that is completely suited to your needs. You can even get a ticket delivered electronically, not just to your email system, but to your mobile phone as well. How cool is that? So with all these ways of buying a ticket, it really is simple to travel by National Express coaches. In fact, you'd be silly not to! Have a comment or question about travelling with National Express for everyday journeys or on the National Express Holiday package? Share it! Return to "National Express" from "National Express Coaches"